Last week I had a powerful conversation with my coach where the fear of “what will people think?” came up big time for me. Because even though I’m considered to be a fairly visible entrepreneur who teaches workshops, speaks and emcees events monthly, I’m on my edge of knowing I’m here to expand, reach way more people, and be seen even MORE. And I imagine YOU are dancing around your edge of desiring to be seen and visible; to share your message in a much more powerful, potent, and expansive way; to exponentially grow your income and impact; and to attract more amazing people that you love to work with to your tribe. 1) It doesn’t really matter what people will think. And it DOES matter. Because I’m a sensitive soul and I can’t deny that it hurts when I feel ignored or put down. So I’m learning to hold BOTH and get support when I need it. 2) The more I put myself “out there” in a bold, NO pussyfooting, watered-down way, the more people I can help. The RIGHT people. And it’s totally OK and even makes my life easier and more fun when I REPEL the ones I’m not here to serve! 3) The “what will people think?” voice isn’t the REAL ME. It IS a common voice that is part of my shared humanity with others, but it isn’t the Truth, with a capital “T,” and it has no place in the Divine Me. 4) And, finally, this insight really cinched it: I’m here to get my message out and reach way more people there through speaking, videos, livestreams, etc. because I’M IMPORTANT. And this relationship I have with myself is truly the most important one of all! Where are you wanting to step up and be seen more? With speaking? Workshops? Creating videos? Doing Facebook Lives? Underlying the voice of “What will people think?” is a core fear that you will lose love, acceptance or be rejected by others. And one of the best ways to move beyond your fear is to get into action and receive the abundance of support around you. With my 30-year background in marketing (yes, I started when I was 5! ), I’m here to help you clarify and communicate your message so that you captivate your audience and scale your income and impact. 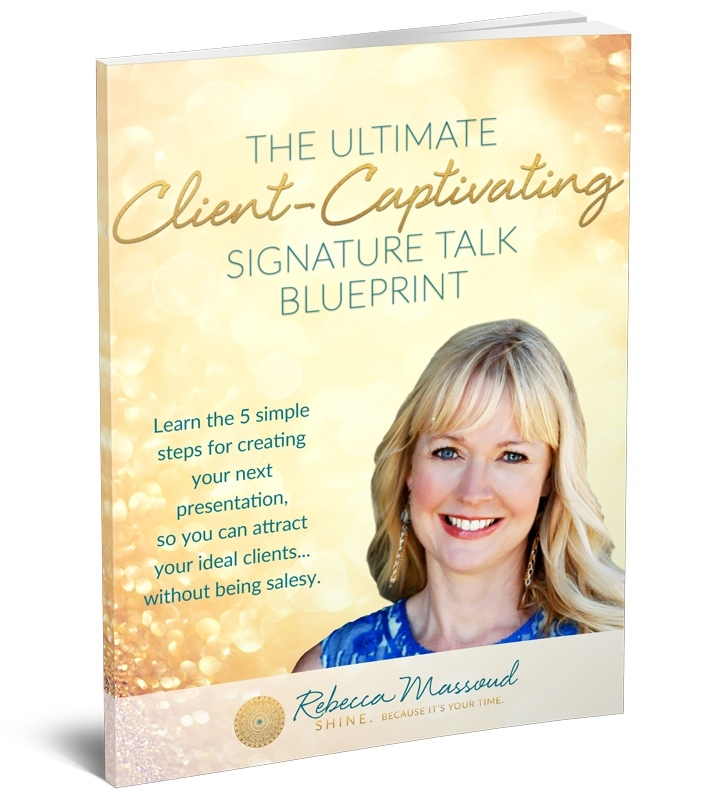 I’d love to invite you to my 1-day workshop called Speak, Shine, Sell, to create your client-attracting signature talk and use this as your launching pad to greater VISIBILITY, income and impact. The workshop is coming up on Friday, September 28, and you can get all the details and register here. Because you are part of my community, I’m offering a $50 savings when you sign up by this Friday the 21st! Use code SHINE50OFF at checkout. Wouldn’t you agree we need more light-filled transformational messages that inspire hope, positivity, enthusiasm, joy and freedom? I know this is what YOUR message is about. And we need to hear it. Don’t let the fear of “what others will think” stop you from shining, sharing your transformational insights and expertise, skyrocketing your income, and serving way more amazing people. Do it for you. Because you’re important. You matter. Your light is needed just as much as anyone else’s. P.S. I’m proud to say this will be the 14th time I’ve taught the Speak, Shine, Sell Workshop–and it keeps getting better. I’m truly grateful so many entrepreneurs have loved it and benefited from it. Read what other soulful entrepreneurs say about Speak, Shine, Sell here. 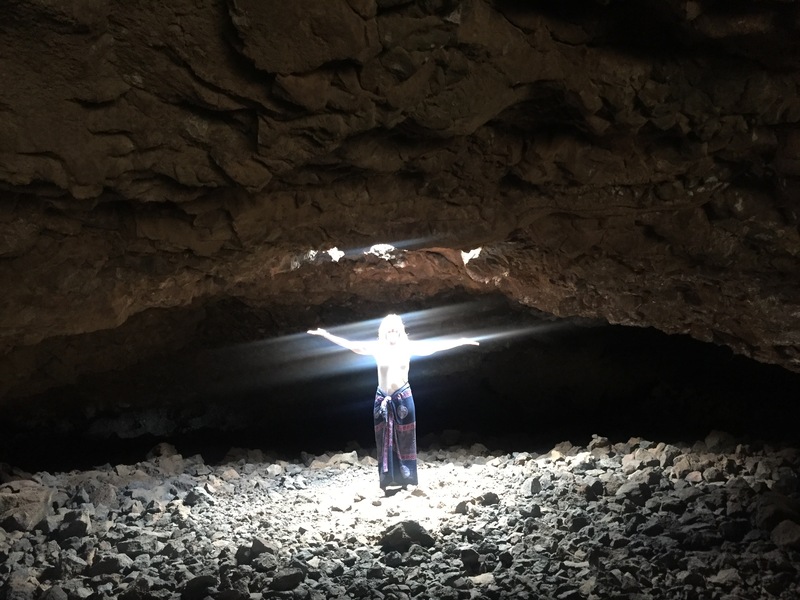 https://rebeccamassoud.com/wp-content/uploads/2018/10/IMG_3224.jpg 296 430 Rebecca Massoud https://rebeccamassoud.com/wp-content/uploads/2017/02/Rebecca-Massoud-SHINE-Because-Its-Your-Time-300x54.png Rebecca Massoud2018-10-11 10:59:172018-10-11 11:09:52Here's how I respond to "What will people think?" One of the best tools I know to keep me happy and thriving in my business; having lots of free time for myself and my family; AND living like the Goddess CEO/wife/mother that I know myself to be…is my calendar! Most often, if it’s not on my calendar, then it doesn’t happen. So I tend to be pretty obsessive about calendarizing just about everything that’s a priority for me. And not just the business stuff like client sessions, marketing, attending networking events and daily money tracking. 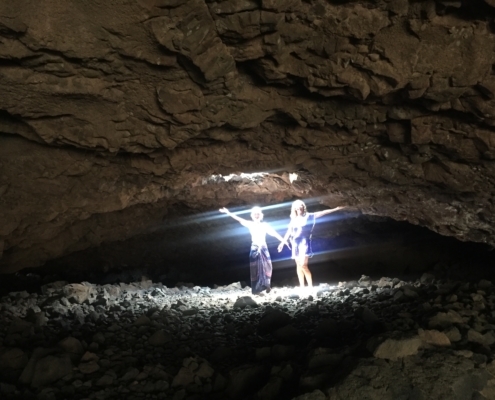 But all the personal stuff that lights me up: daily meditation, yoga classes, date nights with my husband, afternoon fun with my son, weekend hikes with my family, a weekly Skype call with a dear friend, vacations, quarterly self-love days, cleaning out my garage like I did last weekend, and so on. My calendar literally makes things real in my life! It keeps me focused and out of overwhelm, and helps me stay in my sweet spot. ​I know, I know. Some of you may think ​too much on the calendar can sound constricting or rigid. In fact, it can be just the opposite… liberating and freeing you up to focus and do ONLY the things that light you up! Here are a few simple tips to have your calendar be a trusted tool for creating what you really want in your business and life. ​1) Remember, you’re the boss. Have the mindset that YOU are in charge of your calendar and get to choose how you spend your time. So it’s not about being a slave to your calendar. If you notice you’ve over-scheduled yourself one week, you have the power to change it and make it work for YOU! Time is the only thing we ALL have in equal measure–unlike money, education and opportunities, which are wide and varied among all the diverse people on this planet. But we all have access to the same amount of time. We all have 24 hours in a day, 365 days in the year or “five hundred twenty five thousand six hundred minutes” as the song goes! Yet, most of us walk around feeling time-starved. Do I LOVE what I see? Is there something on there to reschedule or let go of completely? What would make an important activity that I don’t enjoy doing (like bill paying or marketing) more FUN for me? Bonus Tip: Put your weekly calendar review time on your calendar! Set a recurring appointment with yourself and take these 15-20 game-changing minutes each week to be the boss of your time. 3) Use your calendar to manifest what you want in your business and life. One of the secrets I learned early on in my business is when you want to create something–whether that’s more clients, money or speaking engagements–is to get ready for it as if you are certain it’s going to happen. “Dig ditches,” as the saying goes. So I started scheduling client appointments in my calendar–even before they signed on with me or I even knew who they were! And what I noticed is that once I created space for them in my calendar and confidently acted as if it was happening, new clients showed up to fill those spots I had blocked out just for them. This works for everything. Want more speaking engagements? Schedule them in. Want more self-care days? Schedule it. More vacations? Schedule it, even if you’re not sure yet where the money is going to come from. Because your brain doesn’t know the difference between what’s real or not, your subconscious will get to work fulfilling what you desire. And your calendar will serve as that visual reminder and reinforcement for the business and life you truly want to create. Here’s to doing MORE of the things that light you up, so you are free to shine like the radiant rockstar you are! I’m so overwhelmed! There’s so much I need to do — and should to — to grow my business. I feel like I’m spinning my wheels and not getting anywhere. How do I focus and prioritize? Help! Something has to change. I definitely go through waves of feeling overwhelmed in my business and other parts of my life, especially when family demands or a crisis call out for my attention. When you’re in overwhelm, it most likely means you have too much on your plate or the wrong things on your plate, you’re spending too much time on non-revenue-generating activities, or you’re not reaching out for support in the ways you need to. Here’s a quick 3-question exercise to get you out of overwhelm and restore your focus on the things that really matter in your business, which I believe are revenue-generating activities that light you up so you can continue to make the difference you’re here to make! Before you start, take a slow deep mindful breath. 1) What’s one activity you can give up or let go of? 2) Where’s one place you can say “no”? 3) Where’s one place you can clear up clutter? Invest the 5 minutes now to honestly answer these questions, and let me know how it goes. I just did this exercise and quickly deleted 4 things from my “to do” list and said “no” to a networking event tonight. I also committed to clearing the clutter of my desk by the end of this week. Now, your turn! Affirm: I let go of overwhelm and practice saying “enlightened no’s” to people, situations, and opportunities that do not serve me at this time. Each moment of my workday solely exists to bring me joy. I remember to lighten up, laugh more and appreciate more. All is well. What does LOVE have to do with marketing your business? Because if you’re doing marketing begrudgingly, skipping over key marketing channels, not doing enough marketing, or avoiding promoting yourself altogether, then you’re missing out on serving your clients with your gifts and growing your business to the next level! So, with the eyes of love, let’s take a look at your marketing and see how you can fall in love with this essential building block to making a big income and an even bigger impact! 1) Start with a mindset shift: see marketing as an act of service. You might think of marketing as being icky, hard and a necessary evil that you HAVE to do, or do very little of it so that you don’t come across as salesy or overly-promoting yourself. The truth is: when you come from generosity–educating with tips and resources and letting your audience know how they can take it further with you–marketing is an act of service. The key is to share freely your inspiring tips, strategies and offer–without attachment to someone saying “yes” or buying from you. So many entrepreneurs I talk to are overwhelmed with ALL the ways you can market your business. We hear the expert calls: LinkedIn! Facebook Ads! Speaking! Webinars! SEO! Referral-based marketing! Networking! Joint Ventures! The truth is there’s no RIGHT way to market your business. All of these strategies work in various degrees, depending on your personality, your target market, your business type, and what stage of growth you’re in. So to not fall into the overwhelm-trap, discover what are the 1-3 ways you LOVE to market your business. What feels light and natural to you? Is it speaking and networking? Is it social media and online marketing? Or some other combination? Then, FOCUS on mastering these 1-3 areas FIRST before you move on to the next strategy. Bonus Tip: Be sure to get support for the marketing strategies you want to master. Don’t go into avoidance just because you don’t know HOW to do something. For example, I recently realized I had been avoiding important aspects of social media as a way to grow my business. I had the perfect excuse of “not having enough time.” Now, I’ve made a decision to get support in this area. What a relief that I don’t have to know HOW or figure it all out on my own! 3) Start a Daily Marketing Love practice. Most entrepreneurs I meet don’t do nearly enough marketing in their business. If you tend to full into that category or want to up your game, I recommend a Daily Marketing Love practice. Start with scheduling at least 30 minutes in your calendar everyday for taking inspired marketing action. Go ahead and block this time out in your calendar right now. Then, set a timer for 30 minutes to keep you on track and distraction-free. If your mind or your fingers start to do other things (like how many times do you lose track of time on social media? I’m totally busted on that one! ), remind yourself to come back and focus on your marketing. Use this time to connect. Make calls to prospective/former/current clients, follow up with emails, and reach out to group leaders to inquire about speaking opportunities. Or connect with your online audience, whether that’s creating your new online course or webinar. P.S. If you’re looking for marketing support (plus, judgment-free kick-in-the-pants) to grow your income and impact this year, I’d love to talk to you. Just click here, and we can set up a no-pressure chat to see if we’re a fit to work together. 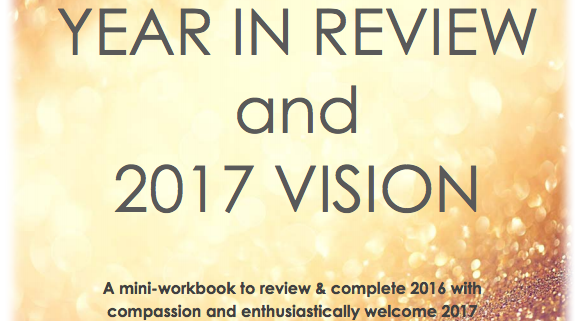 I’m excited to offer you a Year-in-Review and 2017 Vision Mini-Workbook to support you in powerfully completing last year and propelling you into greater success and money flow in 2017. Is Your “Should” Voice Getting in the Way of Growing Your Business with Ease? Because when I say it to myself (Rebecca, you should really do this, for example), it’s typically said in an authoritative, bearing-down sort of way that feels so disempowering to my spirit. In the 5 years I’ve been in business and in my 20-plus-year marketing career, I’ve “shoulded” on myself plenty of times. And more often than not, these “shoulds” have taken me down paths that have felt out of alignment or proved to be bad timing, resulting in some costly, messy or uncomfortable situations—a bad hire for a marketing assistant, investing in a costly online course that I never use, and, more recently, prematurely trying to launch a group coaching program. What happens is it can take you in directions that aren’t aligned with your inner knowing, such as taking on projects that are other people’s priorities or doing marketing activities that the “experts” say to do, but aren’t the right ones for YOU and your ideal clients. Or you can find yourself stuck and spinning your wheels, so that you’re not building momentum, not consistently attracting new clients and not making the money you’re wanting in your business. Here are 3 of the most common “should” statements I hear and my tips on how to transform that disempowering voice into soul-inspiring self-talk—and action! 1) I should be further along in my business than I am now. To address these hidden beliefs, you need a good healthy dose of self-compassion. Because without the practice of self-love and acceptance, we can beat ourselves up pretty good—and either push ourselves harder or give up completely. Self-compassion is definitely not a luxury; it’s necessary for success! Action: Acknowledge and accept exactly where you are in your business. You can simply say: I am where I am, and I’m OK.
Secondly, from this place of acceptance, declare that you want more. Say: I am at peace with exactly where I am, and I want to create MORE—more clients, more money, more visibility, and more opportunities to give my gifts. Finally, ask yourself: From this place of acceptance and desire for more, what support or training do I need to grow to that next level and attract my ideal clients? What do I need to let go of to create space for more of what I want? 2) I should take this client because I need or want the money. I better take what comes to me, as there may not be another opportunity like this. This is probably as good as it will get for me. The Universe has brought me this person, so it must mean he/she is the right fit. Personally, I’ve gone through a lot of growing pains with this one. But this year was a turning point. In another situation a few months ago, I quickly passed on a prospective client who I discovered wasn’t the right fit in our initial phone conversation and referred her to another coach who it turns out was thrilled to work with her. The “old Rebecca” would have stayed longer in both of these situations and tried to work it out—because I used to operate under the paradigm that when money is on the table, I have to stick with it and make it work. Now, I’ve learned to put a stake in the ground, trust my gut, and say a graceful “no, thank you” to ones who are not ideal. Action: Practice listening to your intuition and noticing those bodily sensations in your gut. Be willing to pass on non-ideal clients and trust that your enlightened “no’s” will lead you to your ideal “YES’s”! 3) I should do this (fill-in-the-blank) marketing strategy or attend this networking event. I don’t want to be left out or get left behind. Everyone else is doing it, so it must mean I need to do it, too. I don’t want to look stupid or uninformed by not engaging in this marketing strategy or attending this event. I get it. You don’t want to feel left out, not “with it” or like you’re not behind the 8-ball in your business. But what can happen when you follow these “shoulds” is a big giant feeling of overwhelm—resulting in a lack of clarity and forward movement in your business. Action: Pick 1-3 marketing strategies you want to focus on for now—that feel right and light for you, your personality and your ideal clients. And simply let go of the rest. You can always come back to them at a later time. Between now and end of January, I’m offering a limited number of Complimentary Business Clarity Sessions designed to support you in paving a path to a powerful 2017. This is a laser-focused session to discuss your business and life vision for the New Year. 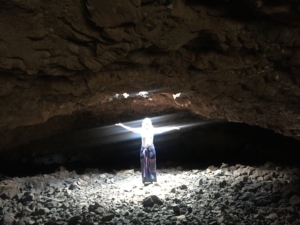 The intention of the session is to clarify where you are now, the transformation you are seeking, and if it makes sense to explore working together. These complimentary sessions are my way of giving back and fulfilling my mission to support soul-inspired female entrepreneurs to create a big income and an even bigger impact with their gifts. Go here to request your complimentary session now. 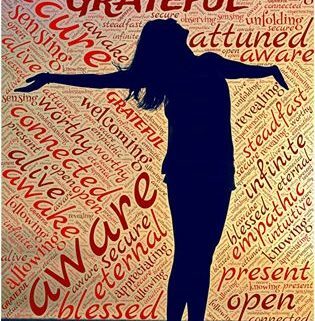 Appreciation and gratitude are high-vibe states I love to cultivate regularly, and not just when things are going my way. Especially when it’s challenging, uncomfortable or painful, I make it a practice to feel my feelings fully and, with time, find the gift in the situation. So on this Thanksgiving Eve, I’m called to share a personal email with 22 things I’m appreciating in my life right now. 1) I appreciate my intuition. 2016 has been THE year for me to 100% commit to following my inner guidance in everything. Which means it doesn’t always follow what the business experts say to do, make sense, or look like the best marketing strategy. However, when I listen deeply to my own inner GPS, I am so much happier! And one of the cool byproducts is that since I made that commitment mid-year, my revenue has doubled. 2) That being said, I appreciate all the business mentors, marketing experts and the invaluable coaching, advice and support I’ve received. Having high-level support to help me grow my business is one of my top values, and I’ve made incredible strides in expanding my reach, my offerings and my income through the guidance of mentors and coaches. However, the shift for me in 2016 is staking my claim as CEO. I’m the boss of my business, and I get to practice discernment in deciding what advice or strategies to follow. 3) I appreciate my husband and son. Getting married in my late thirties and having a child at 40 was a longtime dream-come-true, and I feel tremendously blessed to have these two amazing guys in my life. Having extraordinary relationships with both of them does take truth-telling, commitment, compassion and lots of patience–not always easy. Why is it that all of my “stuff” and emotional triggers come up the MOST with the two people I LOVE the most?! 😉 The “work” that’s required, however, is SO worth it for these priceless beings. 4) I appreciate my extended family and dear friends in California, Texas and other parts of the U.S. Wow-wee, are there differences among my family members that could look like sharp divides! Particularly when it comes to political viewpoints, spiritual beliefs, and lifestyle choices. However, I celebrate our diversity and the fact that we find many areas of common ground, especially when we come from love. 5) I appreciate my son’s learning challenges. One year ago my son had to leave a private school that we loved dearly. Out of that extremely painful situation, we discovered our son’s learning challenges and have been steadily getting him support for his unique learning style. 6) I appreciate my morning quiet time. I love getting up early an hour or two before my family each morning and having precious time all to myself–to read, journal, meditate, stretch, watch the sunrise, and savor my morning cup of coffee. This is one of my essential daily practices that keeps me lit from within. 7) I appreciate my yoga practice. I’m so grateful to have a physically challenging practice that has sustained me for more than 20 years. 8) I appreciate my business. Woohoooo! Another longtime dream-come-true. Being an entrepreneur is definitely not the easy path. It causes me to dig deep, stretch beyond my limits, grow through extreme discomfort, and pick myself up again when I’ve seemingly failed. Have I had thoughts of giving up or doing something else in the 4 years I’ve been in business? You bet. But overall, it’s a thrilling ride–one that is THE most fulfilling career path I’ve ever been on. 9) I appreciate my clients. Have I been lucky and blessed with the most amazing clients! It’s so rewarding to witness them growing their income and impact, moving far beyond what they thought was possible for their lives, and becoming more of who they authentically are. 10) I appreciate all the participants in my workshops and classes. 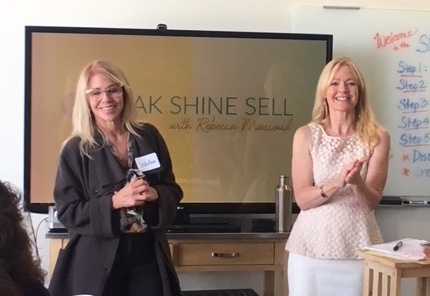 What a thrill and blessing it’s been to deliver my Speak, Shine, Sell Workshop to enthusiastic participants 5 times this year, with one more coming up in December. Listening to and following my intuition one year ago resulted in me creating this successful workshop. 11) I appreciate my San Diego business and networking communities. Namely Women’s Wisdom, Hera Hub, and the Business Unusual Breakfast Club. Not only have I grown my business through these groups, but I’ve started to cultivate some deep and lasting friendships with the people I’ve gotten to know, that goes far beyond business. 12) I appreciate YOU. Thank you for being on my mailing list and reading my emails. Some of you I know very personally, some of you I’ve met only once or twice, and some of you I have yet to meet. But the fact you’re here tells me there is value in our connection, and I promise to continue growing this value, supporting you in creating the business and life of YOUR dreams, and, hopefully, exceeding your expectations in 2017! 13) I appreciate my “rock star” Mastermind partners. Each Monday morning for one hour, I meet by phone with two amazing women who are lifelong best friends of mine and also entrepreneurs. What started mostly as business-focused support almost 4 years ago has evolved into supporting each other in EVERY area of our lives. 14) I appreciate the books that have made a HUGE difference in my life this year. These include Florence Scovel Shinn’s books The Game of Life and How to Play It, Your Word is Your Wand, and The Magic Path of Intuition (all written in the 1920s – 1940s), plus Regena Thomashauer’s newest book. 15) I appreciate the year-long Mastery Coaching Certification Program I’m in this year. It was a big fat investment, and I’m grateful I’ve been able to pay it off and benefit from the tremendous mentoring, coaching, and business and leadership training I’ve received. 17) I appreciate my daily money tracking practice. This is another one of my “essential daily 3’s” where I get to practice being mindful with my money each day and be with whatever feelings come up–the high of having a fabulous revenue month and the low of having an embarrassingly low month. 18) I appreciate all the support I have in running my business. Last year I made a critical decision to hire administrative and event support even before I thought I could afford it. I’m so grateful for my VA Cathy and event assistant Amy who free up my time so I can focus more on my genius. Plus, my rock star husband continues to be just that–a rock star who does everything from Chief Financial Officer to Chief Photo Copier. 19) I appreciate all the personal support that contributes to my business success and overall wellbeing. Here’s a small list of who’s made a big difference in my life this year: Judy & Ken Foster of Women’s Wisdom, Tziporah for relationship mentoring, Serena Jenichs for amazing hair styling, Orly of Bella Sareena for incredible facials, Ana Nieto for transformational weight training, my yoga teachers Geri and Chris, and Josee Brisbois for a fabulous closet makeover. 21) I appreciate my failures, fears and foibles. They make me into a more well-rounded Rebecca, remind me to stay humbly human, give me a good laugh or cry sometimes, and compel me to cultivate greater compassion for myself and others. 22) I appreciate my country. Thank you, Universe, for placing me smack in the middle of the USA where I was born, and then calling me to California in 1994. I LOVE living in San Diego near the Pacific Ocean and am so grateful I have the freedom to live the lifestyle of my choice. I will continue to pray that each person everywhere has the freedom to authentically choose and create the life of their most heartfelt dreams. Now you, my dear. What’s on your appreciation list? May you find many things to appreciate and celebrate in your life!